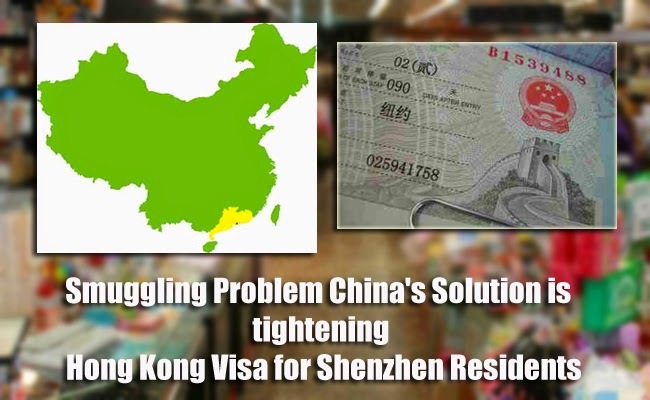 China officially tightens their multiple-entry visa terms for the mainlanders in Shenzhen who are visiting Hong Kong in response to the growing goods smuggling problem across the boarders as reported on April 13, 2015. The decision was made to act on Hongkong’s request. The decision will be immediately implemented on Shenzhen residents who used to have unrestricted entry to Hong Kong, now they can only cross the boarder only once a week as stated by Xinhua News Agency. The mainlanders must now apply for visas if they wish to go to Hong Kong even though the law was returned to Chinese rule. In 2009, the multiple entry scheme in Shenzhen had boosted the tourism from the mainland, however, the accommodation capacity of Hong Kong was strained. According to Hong Kong Tourism Board, in 2014 Hongkong had 61 million tourists and 78% were from the mainland China. However, smuggling problems also grew rampant due to the mainlander’s lack of trust in their own goods, especially with the milk formula. Some traders were using tourists to smuggle the goods towards the mainland. The goods will then be repacked and sold without paid taxes or sometimes, escaping bans. Due to long lines of smugglers trying to pass through undetected and limited supply of goods in the mainland, Hong Kong needed to handle the boarder control more tightly. Aside from smuggling another problem the new policy wished to address the over crowded situation in the shopping districts. This also causes conflicts when Hong Kong residents takes photos and videos of non behaving mainlanders.